Read this in-depth Toronto Star series on how the Ontario Municipal Board wields its unelected power over a city crunched for resources: Contested Development. The OMB is a quasi-judicial, un-elected and un-accountable provincial body that has the final say on all planning decisions in the province of Ontario. The tribunal’s powers to overrule decisions made by our elected municipal representatives are anti-democratic and often lead to planning decisions that far too often support the interests of the development industry over those of our communities and our city’s official plan. Since the establishment of the Ontario Municipal Board (OMB) in 1906—initially as the Ontario Railway and Municipal Board—it has evolved from an approval authority into an appeal body in matters of land use planning. 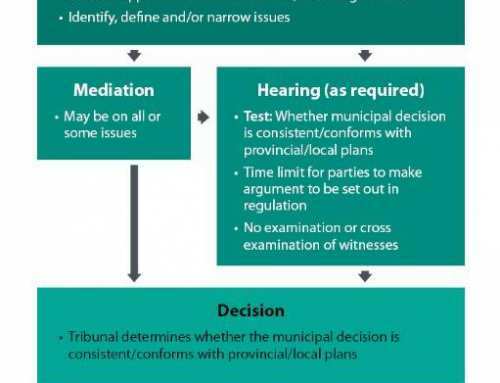 However, the term “appeal” is misleading as the OMB treats appeals of municipal planning decisions to the OMB as “de novo”, or new, giving little deference to the rulings of democratically elected City Councils. It is wrong that our elected local representatives and professional planners in Toronto are overruled by appointed OMB members who generally have only a vague understanding of our city and the fabric and character or our local neighbourhoods. Click here to download this information as a brochure to print and share. Toronto’s midtown neighbourhoods are facing an unprecedented number of development applications. 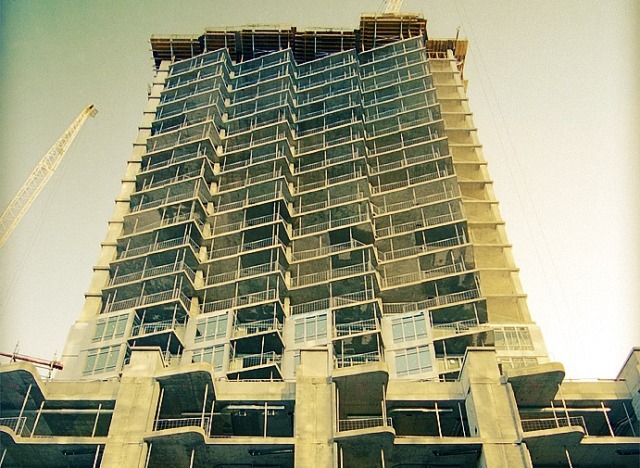 While our community understands that a reasonable amount of intensification is appropriate, developers are proposing new condominiums that are too high and dense for the neighbourhood and, in many cases, appealing to the OMB at the first opportunity. The provincial government is mandating higher densities in areas such as Yonge & Eglinton but they are not taking into consideration the added stress on fully-enrolled schools, a need for affordable childcare and recreation facilities, public realm, the narrow streets and sidewalks and an already over-crowded subway system, and much more that affects our quality of life. The local context is lost at the OMB. The current OMB hearing process is too cumbersome, too expensive, too time-consuming and too legalistic to facilitate wide-ranging citizen participation and is therefore unfair to the local residents as well as the community at large. 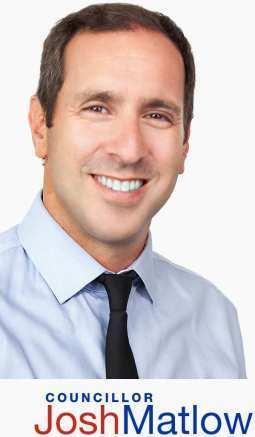 Deep-pocketed developers can hire the best lawyers, planners and other experts to argue their case. They don’t need to worry about taking days off work and the funds needed to argue a case is miniscule in comparison to the windfalls they reap from selling condos. 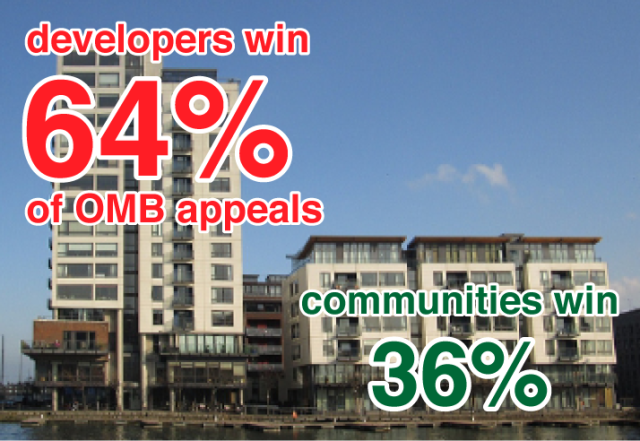 It’s no wonder that a 2009 study found that developers come out on top 64% of the time when facing municipalities. That number is even more advantageous for developers when facing residents’ groups without support from their city government. And if the developer loses they can simply appeal again and face a local group that is likely exhausted both financially and emotionally. Toronto is a rapidly growing city as anybody that lives in midtown can attest to. Our city’s professional planning staff should be spending their time directing, managing growth and implementing our city’s official plan. We want our planners to design complete neighbourhoods with access to transit, vibrant retails strips, green space and social services. Unfortunately, too much of their time is spent defending appeals by developers at the OMB. It takes a planner many days of preparation time for every one day of an OMB hearing. Further, they have to write long, overly technical planning reports in case they are called before the board to defend their professional opinions. And it is not only planners that are taken away from serving the City’s needs by the OMB. City lawyers must spend the equivalent of 1,400 days a year to prepare for, and attend, OMB hearings. City forestry, transportation, technical services staff and others are forced to waste valuable time as well. The cost to Toronto in both staff time and salary is just too great to justify the OMB continuing to have jurisdiction over our city. Our elected City Councillors should be responsible, and accountable, for decisions regarding municipal planning. They have the benefit of ongoing engagement with the communities they represent, and extensive knowledge of local issues, opinions and needs on which they base decisions. City Councillors and the planning staff’s ability to plan is undermined if applicants calculate that it is in their interests to treat City processes as a mere formality en route to the OMB. 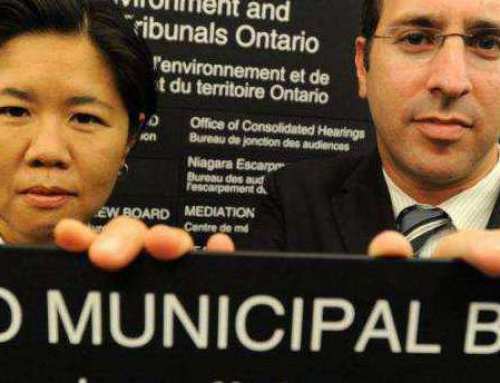 In February of 2012 a motion moved by Toronto City Councillors Josh Matlow (Ward 22 – St. Paul’s) and Kristyn Wong-Tam (Ward 27 – Toronto Centre Rosedale) asked for the removal of provincial oversight on planning matters. This motion was overwhelmingly supported by Toronto’s City Council by a 34-5 vote. Countless Residents’ and Ratepayers’ associations also wrote letters standing behind this initiative. It’s time to free Toronto from the OMB! Toronto has 22 MPPs who sit in the provincial legislature at Queen’s Park. It is important to let your local MPP know that the OMB is an important issue to you. If you don’t know the name of your MPP or your local electoral district, you can search by postal code here. You are also very welcome to write or call me (at 416 392 7906) for assistance contacting your local MPP.